SUNY New Paltz is among the top colleges in the nation at helping students support their study abroad goals through funding from the Benjamin A. Gilman International Scholarship Program, according to a new publication from the U.S. Department of State’s Bureau of Educational and Cultural Affairs. Among mid-sized colleges and universities with undergraduate enrollment between 5,000 and 15,000 students, New Paltz finished tied for fourth place with 13 Gilman awardees during the 2016-17 academic year. “We’re extremely proud that more than 100 New Paltz students since 2009 have benefited from this scholarship, which enabled them to enjoy educational and cultural opportunities they wouldn’t have been able to experience otherwise,” said Bruce Sillner, dean of the Center for International Programs. SUNY New Paltz played an instrumental role in developing the federal legislation that created the Gilman Scholarship in 2001, working closely with Congressman Gilman, who represented Orange County and served as chair of the House Foreign Relations Committee, to support federal funding for Americans to study abroad. 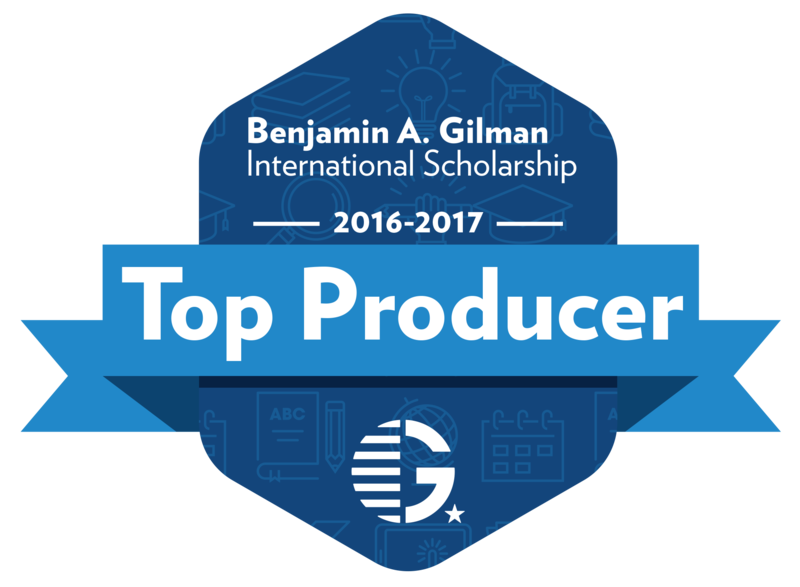 This effort led to the establishment of the Gilman International Scholarship, a highly-competitive, federally funded prize that has been especially valuable for students of limited financial means who wish to pursue educational opportunities in non-traditional destinations. The Center for International Programs has for years partnered with the Educational Opportunity Program to create international opportunities for students from economically disadvantaged backgrounds, and was recognized for these efforts with a 2015 Andrew Heiskell Award winner of the IIE’s Andrew Heiskell Award for Innovation in International Education. Students with an interest in learning more about the Gilman Scholarship and about study abroad can visit the Center for International Programs online. Additional details about the Benjamin A. Gilman International Scholarship can be found at the website of the Institute of International Education.